The X-Men slot machine from Playtech follows the original theme from the comic books and presents a very entertaining slot machine where the “good” mutants comes together to fight the evil terrorist ones. As always, Playtech delivers a high class slotmachine and continue their very popular series of Marvel Comic adaptations to the online casino world. The X-Men slot machine is a 5 reeler with 25 playable lines and a very cool and unique free game feature. 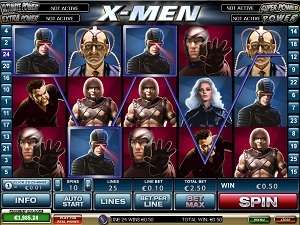 The graphic appearance of the X-Men slot is a mix between the actual characters from the movies presented in a comic book fashion. The heroes and villains are identified by the blue or red background of the characters that appear on the reels. If you hit a winning spin, a music piece is played during the coin count which is unique for each character. The symbols in this slot machine are all characters from the comic book/movies. No bells, cherries or stars, just villains or heroes. Wild: The wild symbol substitute for all symbols except the scatter. Scatter: If you hit three scatters on the same spin, you will activate the free game feature. Other: There is an X-feature that will pay out 5 times your bet is you hit it. You will trigger this feature by combining any of the hero symbols, in any combination in the 5 positions on the reels 2, 3 and 4 that forms the X shape. Free game feature is triggered once you have hit a spin with three Scatter symbols. The free game feature is set to unlimited spins in the “hero” mode but only 8 spins in the “villain” mode. If you hit “villains” wild symbol during the free game feature, the free game feature will change from “hero” to “villain” and the countdown will begin. Please note that you can go back to the unlimited spin mode by hitting the “hero” wild symbol in the “villain” mode. You may bet on 25 lines over the 5 reels. The minimum bet per line is 0.01 of your currency credit and the maximum is 0.10 per line. You may also use the Automatic spin feature which is very comfortable to use. You do have to set the number of spins that you wish to spin, between 10 and 99.